The American Sports Builders Association (ASBA) recognized two McConnell and Associates projects at its annual conference held December 1 – 5, 2017 in New Orleans, Louisiana. ASBA presents its highest awards each year to ASBA members whose tennis courts, running tracks, sports fields, indoor facilities and track and field projects represent the epitome of construction excellence. > MAC received Distinguished Outdoor Tennis Facilities recognition for a nine-court complex at Kearney High School, located north of Kansas City in Kearney, Missouri. This same project earned the Bronze Award overall. MAC earned two awards for its pickleball court project, Chicken N’ Pickle. 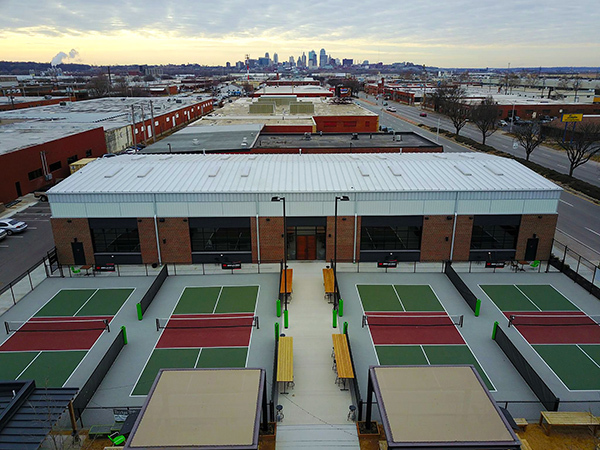 This venue, celebrating its first anniversary, is an indoor and outdoor pickleball facility located in North Kansas City, Missouri, just a few blocks west of MAC’s headquarters. There are four indoor and four outdoor pickleball courts. Chicken N’ Pickle isn’t only popular with the ASBA, but also within the greater Kansas City community. MAC was chosen to construct the pickleball courts, which earned several ASBA awards, including Distinguished Court & Recreational Facilities for Outdoor Pickleball Facilities and Indoor Pickleball Facility. Specific facilities were chosen within each category from among all winning entries to represent the best of athletic facility construction. The Chicken N’ Pickle facilities won the Silver Award and Outstanding Indoor Pickleball Facility of the Year. The ASBA awards are the latest of several that MAC has been awarded recently for its tennis court construction projects. The Tennis Industry/American Sports Builders Association’s Distinguished Facility of the Year awarded its Bronze Award for the College Boulevard Activity Center (CBAC) in Olathe, Kansas. The Concrete Council of St. Louis recognized the Tower Court Tennis Courts project with a Quality Concrete Award. MAC participated in the project, resurfacing not only 25 plexi-cushion surfaced courts at Melbourne Park, but also tennis courts at legendary Kooyong Stadium, former home to the Aussie Open, and courts in Adelaide, where tune-up events were staged leading up to the Open. A variety of courts and surfaces, and the challenges they bring, require having the know-how that only comes from experience. MAC’s team’s expertise is decades in the making, so we bring ingenuity and award-winning results to every court project.